Oh wow, Sage gets dialouge! I’d almost forgotten he was a title character! It….might be for the best he doesn’t get to talk much, but why is all this talk of smoochin’ shrooms turning Saffron red? Find out next time, as Saffron and Sage slowly morphs into the incredibly weird yuri shoujo kinoko-ai harem manga you never knew you desperately wanted. You guys going to see Rogue One? Everyone in my office thinks I’m weird for not going to see it opening day and wanting to wait for the reviews, as as of 12/12 aren’t out yet even though the movie opens Thursday and that’s kind of weird IMO. The trailers looked good, and I’m down for a grittier Star Wars, even if I could stand fewer speeches about Hope than the trailers provided. I also don’t like everyone talking about the Force like it’s common knowledge right before A New Hope, but that ship’s long sailed and Han Solo is just an inattentive idiot who somehow has “never heard of” the galaxy-wide order of Space Wizards that was at its peak less than 20 years ago and people still talk about. But then, I’m of the opinion that the more I find out about the Star Wars universe, the less interesting it is. I like the universe implied by a New Hope, where the Jedi were this secret cult of mystics where anyone willing to learn could potentially join, instead of now when they’re the X-men. Honestly, turning mystic learning into genetic powers is my least favorite trope in long-running serial storytelling, Korra. Getting a little off track here. Where were we? Mushroom Yuri? Y’know what, why don’t we find another topic to discuss, like how great Sabu drew Sage’s face in panel 4. 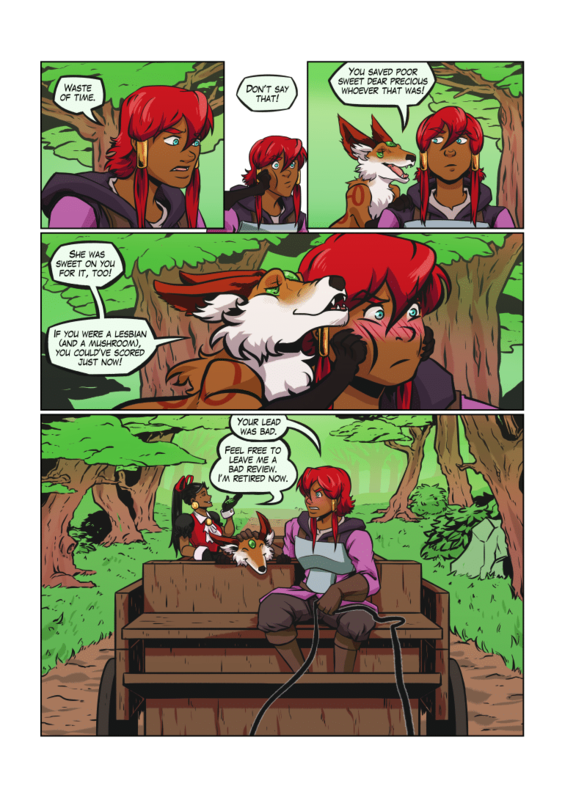 Support us on patreon, and you can get early access to Saffron and Sage and Legend of the Hare, as well as other rewards! Sage: You saved poor sweet dear precious whoever that was! Sage: She was sweet on you for it, too! Sage: If you were a lesbian (and a mushroom), you could've scored just now! Cassette: Feel free to leave me a bad review. I'm retired now. Why do I get the impression that Saffron often wonders why she keeps those two around? Except perhaps as a mascot and a canary, perhaps. But if Cassette retires who will come up with elaborate plans to sneak into crustacean fortresses? Definitely not Sage. Have you seen his investment portfolio?! That fool needs to get his life together.